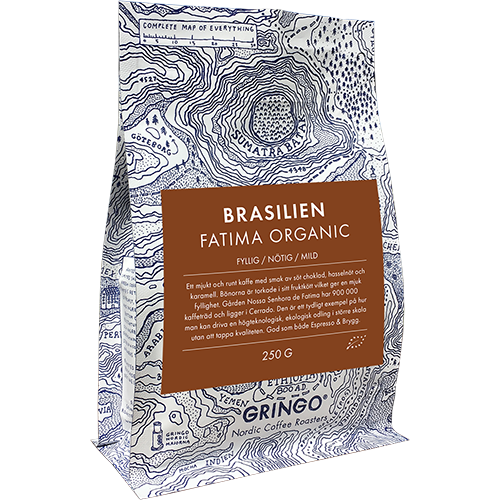 Gringo Brasilien Fatima Eco coffee beans is a soft and round coffee with a taste of sweet chocolate, hazelnut and caramel. The beans are dried in their pulp, giving a soft fullness. The farm Nossa Senhora de Fatima has 900 000 coffee trees and is located in Cerrado. It is a very good example of how to run a high-tech and organic farm on a larger scale without losing quality. Gringo Brazil Fatima works excellent both as espresso or brew.